Several proof of concept exploits are publicly available on GitHub. Undoubtedly, private organizations have weaponized highly functional exploits that will come forward in future. The impact of Meltdown and Spectre in public cloud computing is particularly poignant where organizations had become comfortable operating application workloads in intimate proximity to strangers. No longer can you assume that CPU safeguards will reliably prevent unauthorized access to your data. Your own ability to control risk is limited because the patches must be applied by the hosting provider to the infrastructure layers under their control. 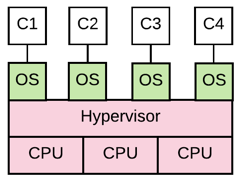 Comparing two hosting scenarios, you can implement mitigating patches and other controls in the operating system in cases where you are hosting a dedicated operating system on a shared CPU (Diagram A). 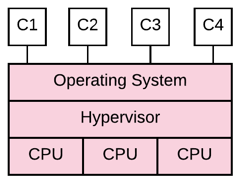 However, no mitigating controls can be implemented when hosting on a shared operating system and shared CPU (Diagram B). In both cases, you are entirely dependent on the hosting provider to patch the layers shaded in red. Not all hosting providers are equal. In the immediate term, you can only hope that the hosting providers used by your third-parties are diligent in their patching. To effect strategic change, it is worth motivating your third-parties to deploy defensible architectures with trustworthy hosting providers. The impacts of Spectre and Meltdown are directly mitigated through patching at the CPU firmware, hypervisor, and operating-system layers. While patching at the firmware layer addresses the vulnerabilities, patching is also strongly advised at the hypervisor or operating-system layers. As of mid-January 2018, firmware patches were proving to cause system instability (Intel Firmware Patch Issues). In all cases, patches should be deployed under the advice of the software and hardware manufacturers, and tested prior to implementation. It brings attention to the issue that might not otherwise exist. The more advisories vendors receive from customers, the more likely the vendor will properly handle the issue. It communicates your concern and expectations regarding handling the Spectre and Meltdown vulnerability. It establishes a basic level of assurance that all of your vendors have some thoughtful information and suggested actions related to dealing with the issue. In cases where your highest risk vendors have not provided proactive remediation communications, engage with them in direct dialog to validate they are giving the issue proper attention within their internal environment and their cloud-hosted systems. Give top priority to those third-parties that pose the highest level of inherent risk to your organization and that are doing significant hosting with cloud providers. Leverage RiskRecon IT profile data to identify third-parties with significant use of cloud hosting providers. Strategically, third-party use of cloud hosting providers requires enhanced risk governance. The security of your third-parties is dependent on the security of their hosting providers. This dependency is even greater in the new threat landscape of fallible CPU security. Current risk governance of use of external hosting providers is generally inadequate, resulting in hosting of sensitive systems in cloud architectures and with hosting providers that are not capable of providing high security assurance. From analysis of RiskRecon’s IT profile data of 10,000 enterprises, we observe that companies often create indefensible hosting scenarios where their systems are unnecessarily fragmented across tens of hosting providers. They are often hosting sensitive systems in cloud architectures that are inherently insecure. For example, companies with over 100 Internet-facing systems host their systems across an average of 30 different hosting providers. While some of these providers are necessary, the majority seem to have no unique value that necessitates the relationship. External system hosting is reasonably consolidated such that security controls can be successfully deployed and operated across the providers. A process is implemented to ensure that systems are hosted only at approved hosting providers. External hosting providers are held to a sufficient standard of security performance and are periodically assessed for compliance. Systems hosted with external providers are subject to the same security control standards as internally hosted systems. Use of free and low-grade hosting where tenants share the same operating system and the same hardware is not allowed. These hosting arrangements inherently limit the ability to implement system security controls and provide insufficient separation between your workloads and the workloads of co-tenants, particularly in a post-Meltdown threat landscape. While not calling out specific companies, low-budget hosting providers offer services such as hosting of a single website for $2.99 per month. Just search for 'cheap web hosting' and you will get a slew of companies that you and your third-parties would be wise to avoid. From your hosting provider standards, create third-party security assessment criteria. Evaluate your third-parties against the criteria and begin enforcing remediation. As this may be a new standard to some third-parties, consider providing advanced communication of the requirement. Leverage RiskRecon IT profile data to identify the hosting providers used by each third-party and improve your assessment. Identify hosting providers where you have high concentrations of risk. For these entities, consider developing hosting-provider-specific standards and including them in your third-party evaluation. For example, if your third-party uses AWS for hosting-sensitive systems, then assess them against an AWS security standard. Use the RiskRecon IT profile data to map out your fourth-party hosting provider landscape. Identify undesirable hosting providers used by your third-parties. Maintain a list of hosting providers considered undesirable. These may include providers that are in the category of ‘bullet proof hosting’, ‘free hosting’, or generally provide ‘low budget’ hosting.' Where used, tactically engage your third-parties to remediate the issue. Alternatively, address the issue during your periodic assessment of the third-party. 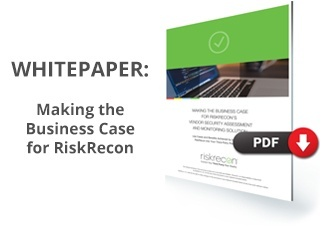 Leverage RiskRecon IT profile data to identify undesirable hosting providers. 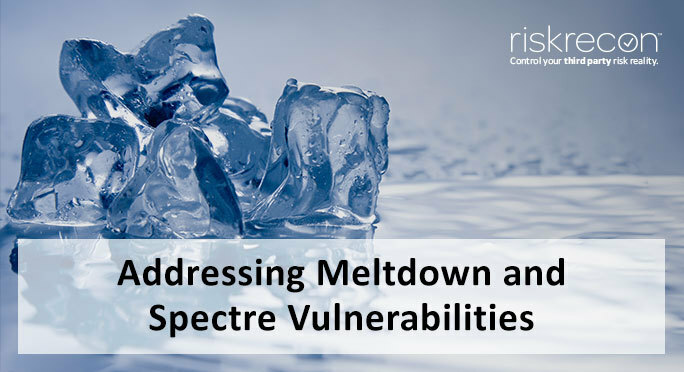 The Meltdown and Spectre vulnerabilities are significant security flaws that require security patching at the firmware, hypervisor, and operating-system layers. The issue is particularly important for public cloud environments where strangers intermingle processes on the same CPU, any one of which could compromise another tenant’s data. RiskRecon recommends tactically engaging vendors to help ensure awareness and to communicate your expectations regarding handling the issue. RiskRecon also recommends strengthening risk governance of third-party use of public cloud hosting. Hosting providers can no longer be viewed as simply providing farms of inherently secure hardware. That is not the case in a post-Meltdown world.